Kehoe made the right choice to write this subject in verse. When a novel is written in verse it comes out almost sounding lyrical and absolutely beautiful. The book seemed mesmerizing and almost haunting at times. This book covers a hard topic but she writes it in a way that people can handle it. The writing is complex but simple at the same time and very easy to follow. The writing is able to let you follow the story but how it is written still fills the book with so much emotion that you feel the intensity of Daisy's sorrows. This book was able to cover some very important topics. It covers autism and what it is like to try to live with somebody who has autism but it also shows the universal topic of setting yourself free and learning when it is okay to let go. The book was able to teach others of an important topic while still making the emotions something people can relate to. Daisy is the perfect character to show this. Daisy came off as someone who is honest and true. She was a character you felt like you could know in your life or you could even be and that really propelled the story along for me. By the end of the book I was very invested in Daisy and her life. My only negative in the book was that I did not find the supporting characters very strong. Daisy's friends just never really stood out to me. Her best friend Justine came off as rather dull and just did nothing for my reading experience. She was a unnecessary figure in the book. I did like the love interest Dave but, part of that was probably to do with the romance factor. 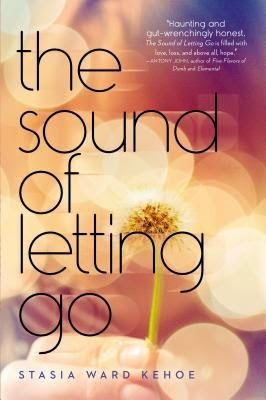 The Sound of Letting Go is a beautifully told story. You will find yourself fully invested in Daisy's life and well being. This a book is a wonderful lesson but also just an amazing book to read. Labels: Stasia Ward Kehoe, The Sound of Letting Go, Viking Children's.